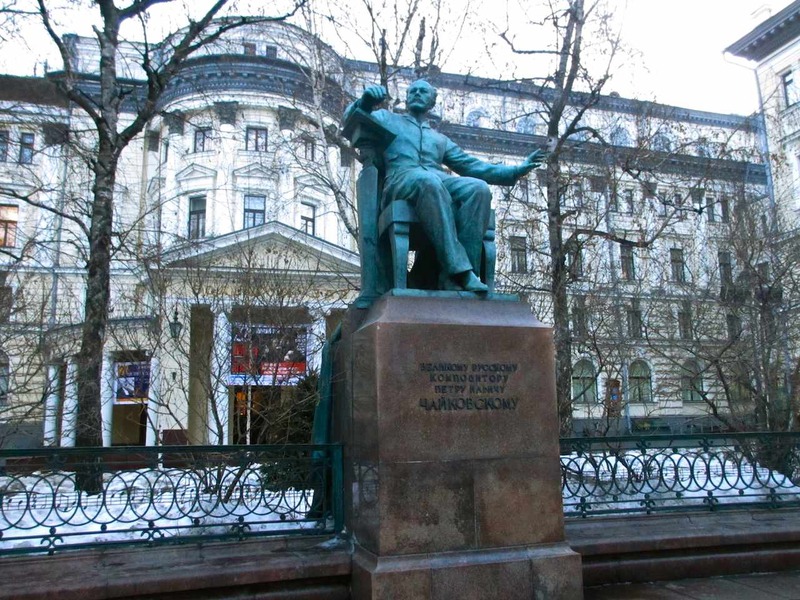 Quite a story stands behind this monument honoring Pyotr Tchaikovsky in front of the Moscow Conservatory at 13 Bolshaya Nikitskaya Street. 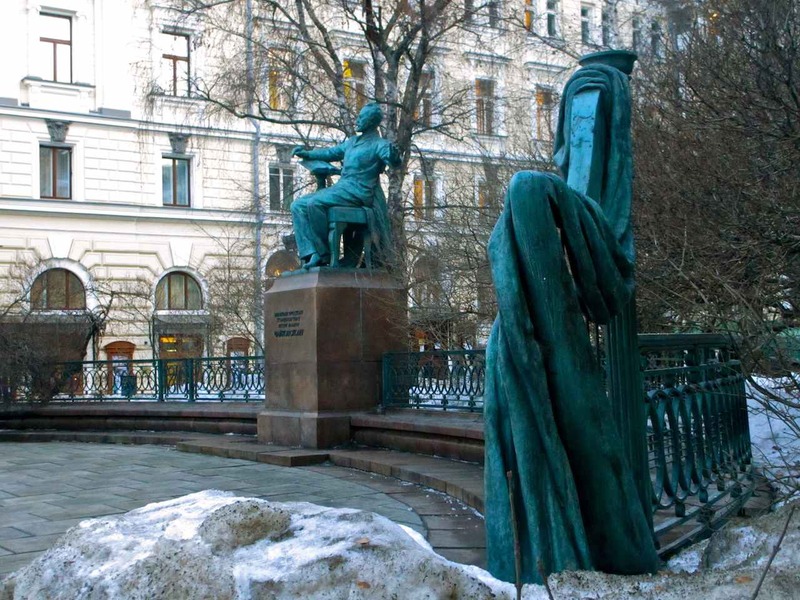 It was conceived, created and almost finished by Vera Mukhina, the great Soviet monumental sculptor. I have written a little about her elsewhere in this blog space. 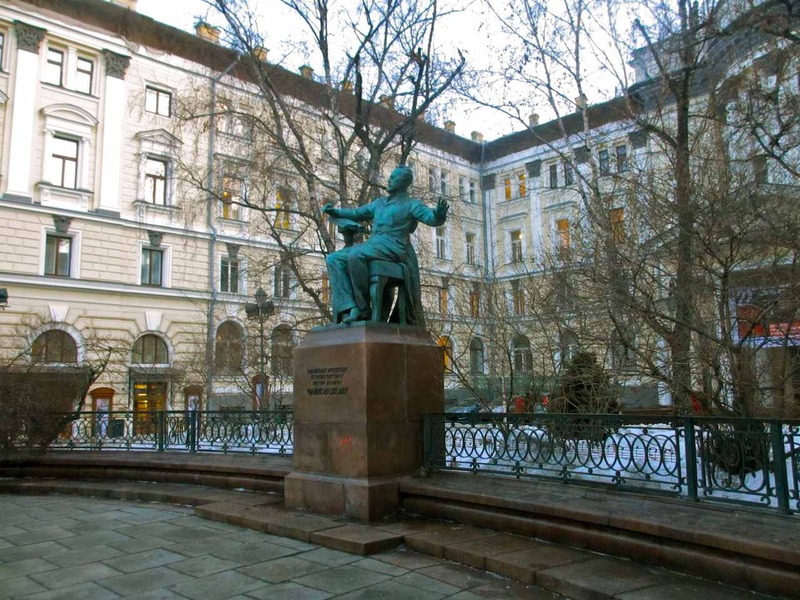 In fact, Mukhina’s first stab at Tchaikovsky was taken in 1929 when she was commissioned by the Tchaikovsky museum in the city of Klin to create a bust of the composer. She was not yet then the renowned artist she would become. 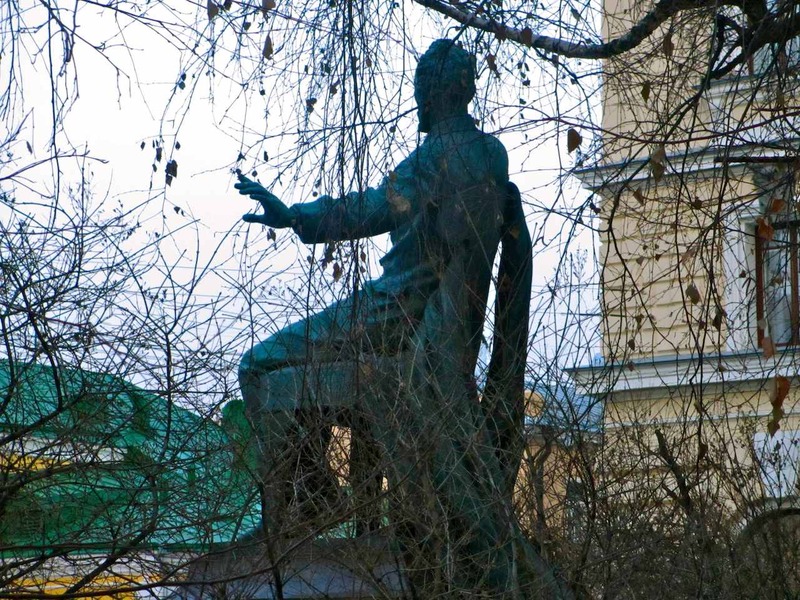 By the time a commission came around for her to create a monument to Tchaikovsky that would stand before the main building of the Conservatory, she was at the peak of her fame. This was 1944/45. I don’t think I’m stretching it at all to say that the authorities wanted to honor a universally beloved figure in Russian culture at a time of great national distress. The sufferings that came with the war were still very much in place as this work quietly began its life. 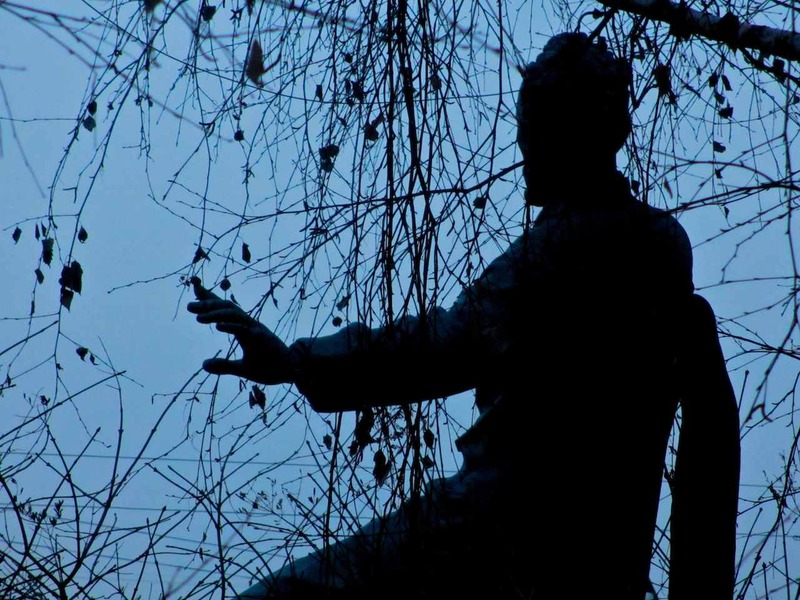 However, the commission that asked Mukhina to create the work did not like her first version, which was intended to depict Tchaikovsky standing and conducting. It was considered that the square in front of the Conservatory was too small to accept the large work she wished to make. Thus arose the plan, more or less, for the monument we now see today. I’ve always found it rather strange, myself: the composer captured in a moment of creative ecstasy as he conducts one of his works – in a seated position. 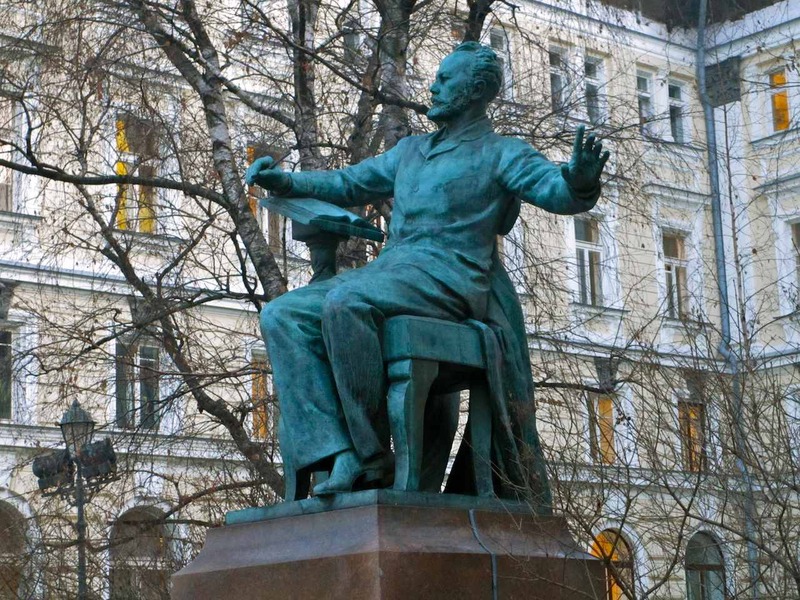 How could anyone conduct one of the great Tchaikovsky works sitting down? 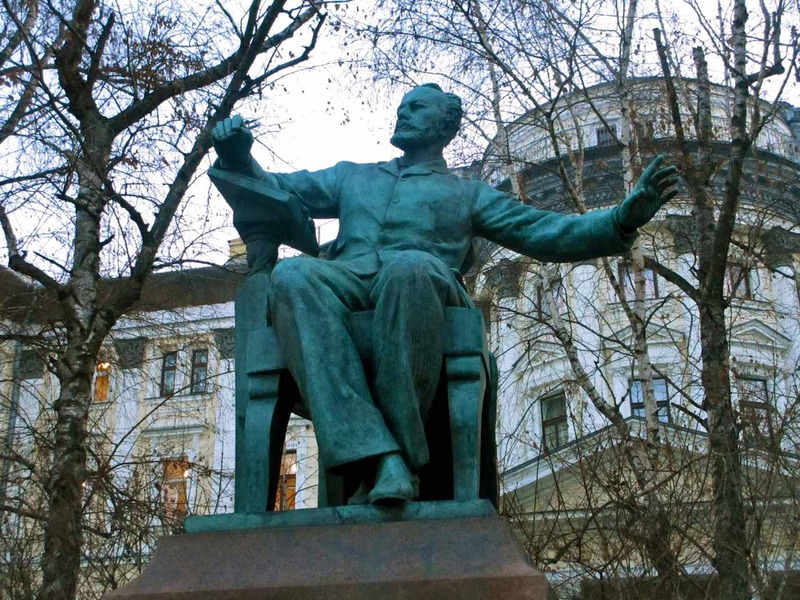 At some angles, it looks more like Tchaikovsky is warding off evil ghosts than leading an orchestra. But maybe that’s just me. In any case, even this version suffered plenty of criticism. As you’ll see in one of the photos below, the ensemble is a large one, with the composer at the middle, but with harps and drapes at either end, some distance from the center. In Mukhina’s conception, there were supposed to be people here, but the commission had her exchange them for harps covered by drapes. And, still, the commission dragged its feet, constantly delaying the moment when the work would be unveiled to the public. Mukhina tried to hurry the process a couple of times by writing to Joseph Stalin and asking him to intercede, but this did not bring results. Finally, as Mukhina lay dying, some half a year after Stalin’s death, she wrote one more letter, this time to Vyacheslav Molotov, one of the top Soviet statesmen (who was Minister of Foreign Affairs at this point). This seems to be the action which finally brought about the decision to erect the monument. It was too late for Mukhina to see it, she died in October of 1953, but her work was officially unveiled in 1954. Mukhina’s pupils Zinaida Ivanova and Nina Zelenskaya put the finishing touches on the work. Come curiosities involved with a major reconstruction of the monument in 2007 are also worth mentioning. It turned out that some 50 of the musical notes which were depicted in the sheet music beneath Tchaikovsky’s right arm were missing. Also missing was a pencil from his right hand. In fact, that was only part of the serious damage that had been done to the work over time. The sheet music on the music stand had been turned at an angle, several screws, bolts and brackets were missing or broken. 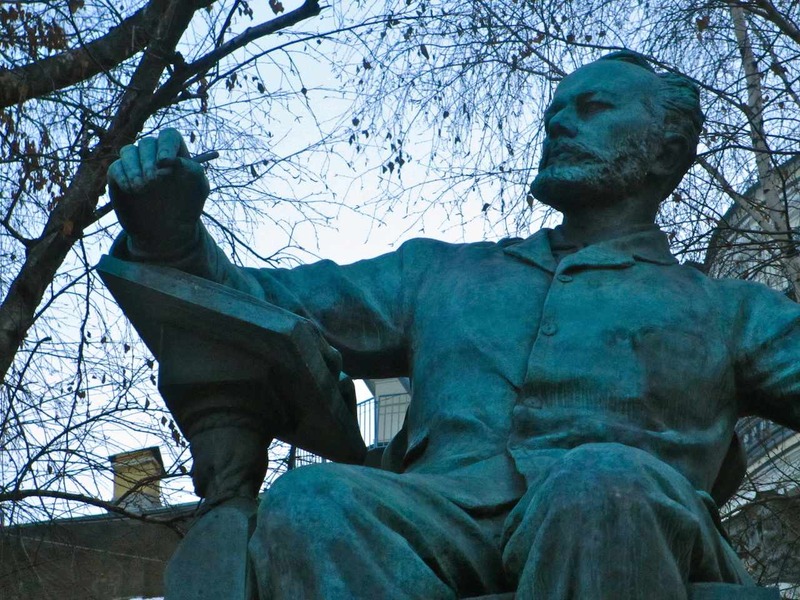 The reason for this, apparently, is a student legend that the notes on the monument are good luck charms which bring good grades, a successful career and success in creative work. (Please note that these latter two kinds of success are quite different.) With a legend like that, it is a wonder that any notes were left at all. The notes and the pencil (I don’t know of any legend connected to the pencil, but maybe it was the only thing left that someone could snap off) were all restored during the rebuilding of the monument. 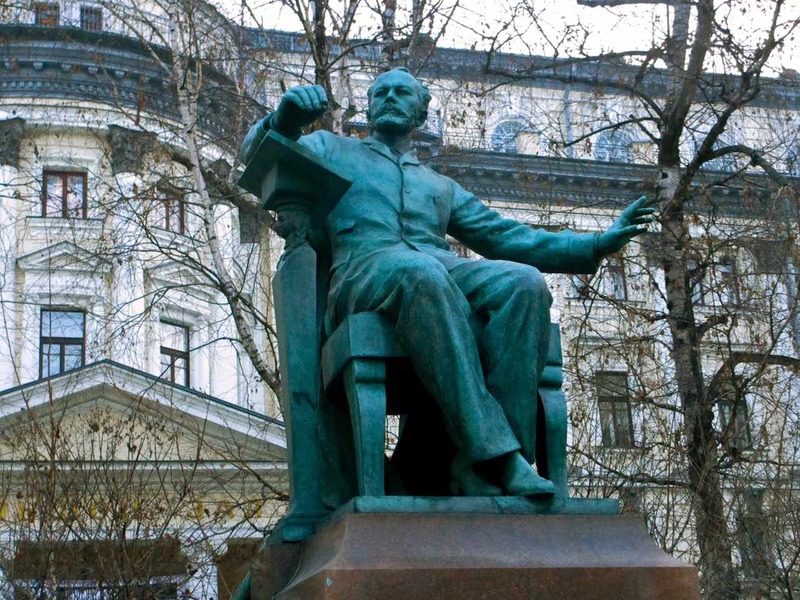 I did not climb up on Tchaikovsky’s lap to see if any of them have disappeared since.